About 83% of the population are farmers. Teff, wheat, and barely are the main crops. Teff is used to make the ubiquitous traditional Ethiopian bread injera. Centuries of erosion, deforestation and overgrazing have left the region with dry and treeless plains, hills and plateaus. Tigray is mountainous, elevation of the region rises from 600-2,700 above sea level, and is one of the richest areas in Ethiopia in mineral resources. 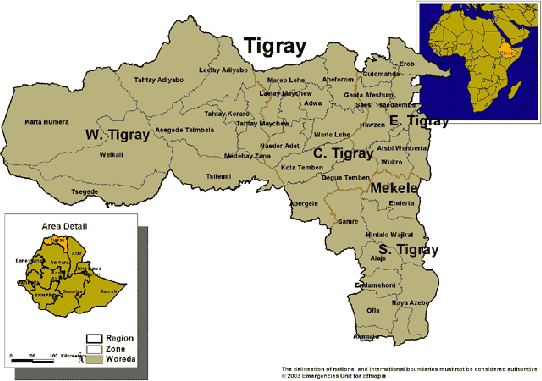 A map of Tigray can be seen in figure 8.1. The Tigray region hold many historical sites. Tigray hold Axum, the seat of the ancient Axumite kingdom. In Axum there is a park of obelisks or Steles dating from as early as the 2nd century BC. Another distinctive feature of Tigray is its rock-hewn churches. This churches are hewn straight out of bare rock. I found it very interesting to hear that the Ark of the Covenant is said to have been brought from the Temple in Jerusalem to Axum. It is said that the son of the Queen of Sheba and Solomon, Menelik, was born in Ethiopia and later lived in Jerusalem. After one year in Jerusalem he was sent back and some of the men sent with him took the Ark of the Covenant. This was brought to Axum where it is to this day, in a chapel guarded by a priest. Only the guardian is allowed to see the ark.